In this post I have written about a book that I’ve enjoyed reading which has helped me to find my own personal style and to express myself more confidently. 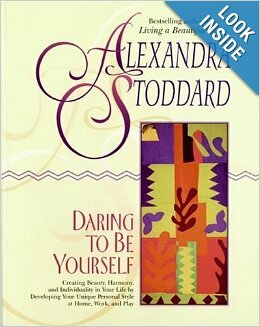 I have gained a lot over the past few years from the writing of Alexandra Stoddard. Though I don’t always agree with her personal beliefs she has encouraged me in graciousness, thankfulness, self expression, grace, confidence, and elegance. She has a way of adding grace to every detail. I would recommend many of her books. Pertaining to style I would specifically recommend Daring To Be Yourself. The funny thing is… with a title like that, I’d probably never pick it up myself. It sounds too ‘self-help all is great cushy mushy believe in yourself’ to me. haha. BUT… maybe you don’t even know what I’m talking about right now and either way, it’s a very good book. Definitely worth reading for personal growth. You can find the book here on Amazon for as little as $0.01!!! Thanks so much for stoppin' by. I am long walks on dirt roads. Love of all things Southern. Family holidays. Sundays spent at church and driving around Tennessee. Pretty pens and comfy blue jeans. The search for the perfect vintage sweater. Thoughts on fashion. Nashville. Adventures in the woods. Head over to my "about me" page to learn a little about this green eyed girl. All images seen on this site are a product of my own photography unless specifically stated otherwise or marked on the photo with some else's label. (as seen in some Reviews) Please... when using photos from my site link back to it and do not claim photo credits. Thank You!